Dozens of neat rows of grapevines I-24 in Clarksville, TN are sure to catch your attention. By late April, the vines have curved up to the wires, wrapping around them, just waiting to bear fruit. A row of large stainless-steel tanks glistening in the sunlight also draw your attention to a building trimmed with a hint of Old Europe. This is Beachaven, an award-winning winery that helped usher in the modern era of Tennssee wine making. When you pull onto the grounds, you’ll see a small stage and picnic tables on the lawn, reminders that this is much more than just a winery, it’s a place to get away and relax with friends, at events like Jazz on the Lawn, a longtime Clarksville tradition. Wine is at the heart of Beachaven and that’s evident when you step inside the building housing the wine shop and part of the winemaking operations. Neat circular racks are scattered around the room, showing off more than two dozen varieties of wine. At the tops of each one, medals hang from the display letting you know just how good the wine is that you’ll be tasting. Judge William O. Beach (a former Montgomery County Executive) started Beachaven Winery more than 30 years ago, becoming a pioneer in the Tennessee Wine industry. His daughter Louisa Cooke and her husband Ed now run the business. On the day we visited, Louisa gave us the tour. She and her staff were busy setting up for a special event. As she tended to some other business, her staff set me up with a tasting. In reading through the selections, it was difficult to narrow it down to just a few. I like dry wines, but my wife likes them sweet, so I wanted to make sure I brought home something we’d both like. That’s when the staff suggested I try the Governor’s Red, a tribute to Austin Peay University (there is also a Governor’s White). I also tried the Syrah which was full of flavor. Beachaven also offers a couple of Muscadine selections, some fruity wines and pays tribute to the area’s strong military ties, with a dozen varieties tied to specific, divisions, brigades and regiments. Following the tasting, Louisa came back to give my son and I a tour of the entire operations. It was quickly evident how much passion she has for Beachaven and how she wants it to be an important part of the community. (She also gave my son a few suggestions for places to take great pictures.) We started with the wine press. Sitting under the awning at the end of the building, Louisa pointed out a red machine that was old and worn to help describe the basics of pressing the grapes. Today, as Louisa explained, the process is done on the much bigger machines behind it. From there we went into the room where the wine is actually made. Two of the winemakers were busy cleaning out the tanks as it wouldn’t be much longer, and it would be ready to make more wine. Louisa just beams with pride as she points out all that goes into the winemaking process including its time in the “Wine Lab.” However, it’s the personal touches at Beachaven that seem to give her the most pride. At the back end of the Wine Shop, large barrels of wine are sitting waiting to be bottled. In many places, there might be a logo or something printed on the ends, but the ones here are true works of art. Louisa explains a man named Dutch, hand carved the ends, transforming each into a unique piece. Dutch was a World War II veteran and a member of the 101st Airborne Division. His goal was to make 101 of them. Unfortunately as Louisa points out, he died before he reached that goal. The last barrel he was working on is still in the shop, with the penciled outline of the artwork still visible. Today, there are more than two-dozen wineries open to the public in Tennessee, and about that many more private vineyards. 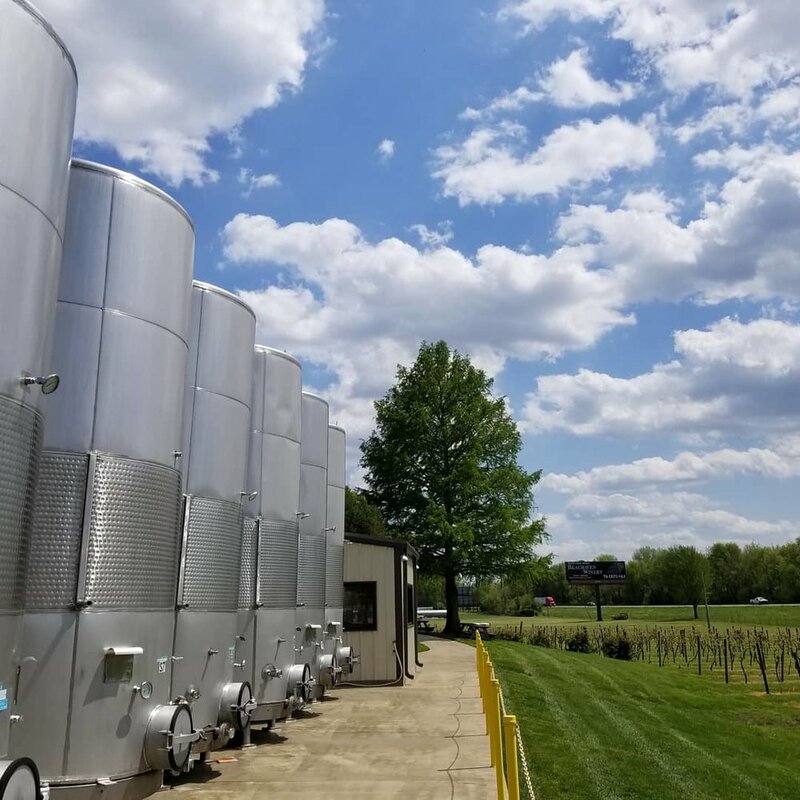 Beachaven stands out from the rest, not only because of the quality of its product, but also the attention the winery gives to the community and the state’s wine industry as a whole. Whether you’re just passing through the area or considering spending a few days there, Beachaven should definitely be on your list. After you've tasted the wines, check out some of the hot dining spots in Clarksville. Click here to learn about the ones I got to try recently.